Once a year Elizma at R99 Wine Consulting personally hosts a very exclusive wine study trip through the winelands of the beautiful Western Cape on the southern tip of the African continent. The study trip is aimed at international wine students and wine educators who desire an in-depth and intimate introduction to the best South African wines and artisan wineries. It is also a unique opportunity to meet and mingle with some of the Cape’s most interesting and passionate winemakers. With an extensive cultural history, some of the most ancient soils in the world and spectacular scenery, the Cape Winelands is arguably the most beautiful wine region in the world. Experience Cape hospitality at its best while enjoying the culinary delights and world class wines of the region. The 10-day tour will take you from the historic vineyards in Constantia, through all the diverse districts of Stellenbosch, Paarl, Franschhoek, Elgin, Walker Bay, Robertson, Breedekloof Valley, Tulbagh, Wellington, Swartland and Olifants River to the rugged Cederberg Mountains, along the way meeting with interesting people with in-depth knowledge of the rich and diverse offerings of the Winelands. Transport through the stunning and diverse landscape is provided in a new air conditioned 12 seater minibus with a professional driver and tour guide, towing a trailer for luggage. Taste wines with various winemakers, from SA’s Winemaker of the year, old stalwarts, young upcoming winemakers to the first black female winemaker in South Africa, while visiting a diverse range of wineries from small boutique family owned enterprizes to large international companies. Visit a unique vine nursery to discover the importance of old vines in SA, and also the Platter Winery of the year, the Chenin Blanc Association, the Pinotage Association and one of the world’s top brandy producers in the world….you do NOT want to miss this lifetime experience! It would be a hollow victory to discover some of the best wines in the world without the opportunity to match them with food of equal quality. Therefore, a large part of the tour aims to showcase the magnificent traditional country fare and hospitality on offer in each wine region. All hotel accommodation, wine tastings and meals are included in the tour price. Air Fares to and from Cape Town International Airport is excluded. Due to the fact that the study trip zooms in on artisenal wineries for personal contact with the winemakers, there are only 10 places available on the tour every year. Participants need to have completed WSET level 2 or an equivalent course in wine studies in preparation for the study trip. Book early to avoid disappointment! Wednesday 26th July: Pick-up by Elizma Myburgh and tour guide at airport (should you wish to come earlier we can arrange accordingly). We drop our luggage at the hotel and head straight to Klein Constantia on the slopes of Table Mountain, which is one of the oldest wine farms in the Cape and home to the world famous Vin de Constance (a wine Napoleon requested on his deathbed). We explore this historic place with its unique terroir and acclaimed wines. After lunch we head towards the city bowl via the scenic road (with stunning views of the Atlantic Ocean) over Chapmans Peak and the Twelve Apostles, for a garagiste experience at Cape Town’s city vineyards. Dinner will be a very special affair with a group of highly talented young upcoming artisinal winemakers from across the Cape. Thursday 27th July: After breakfast we depart for the famous Stellenbosch wine region where our first stop will be at a small family owned winery, famous for their world renowned wines of Cabernet Franc & Chenin Blanc with a few special hidden gems in between. Our next stop will be at a larger estate which is part of a portfolio owned and managed by an international group. Lunch will be enjoyed here with their range of exquisite wines. The evening will be a very interesting wine & dine affair with producers of the Chenin Blanc Association. Friday 28th July: We embark on an early morning vineyard visit after breakfast in the beautiful Helderberg Valley, discovering different styles of Shiraz/Syrah with three artisenal wineries nestled in a hidden valley on the foothills of the Stellenbosch mountains, followed by a quick wine tasting with SA’s first black female winemaker, who has recently launched her own label. In the afternoon we cross the Helshoogte mountain pass to enjoy a special wine tasting lunch at a spectacular corporate vineyard in the picturesque Franschhoek valley, followed by another treat…a visit to a small producer making artisanal sparkling wines by the Agrafe method. The evening will be at leisure in Stellenbosch (no dinner provided, but Stellenbosch has a lot of wonderful street cafes and restaurants within walking distance of the hotel). Saturday 29th July: After breakfast we take a road trip to Wellington for a unique informative visit to one of only two vine nurseries in SA supplying plant material to vine growers, and also taste some of the estate’s artisan wines. Our next visit is at the Platter Wine Guide Winery of the Year, a the world famous producer in Paarl where we will have lunch as well. South Africa is not only known for its beauty and great wines, but it is also home to some of the worlds’ best brandies. We visit a historic brandy cellar which played a huge part in South African wine history. The evening will be a special treat at a prestigious family owned organic vineyard, with a wine tasting dinner in the manor house (one of the oldest Cape Dutch Homesteads still inhabited by the owners instead of being a museum). Sunday 30th July: We head to the cooler, mountainous region of Elgin after breakfast for a visit to a family run fruit business with small boutique five star wines to take in the breathtaking mountain scenery. We also visit a Belgian couple who have settled in this beautiful valley and we get to taste their fabulous Riesling and other fine wines. At the end of the day we are hosted to a wine tasting dinner at a large wine estate, the first winery in SA to successfully hand over shares to their black farm workers. Monday 31st July: We discover the home of one of the Cape’s best Chenin Blancs at a low yielding familuy owned vineyard in Bot River on our way to Hermanus. We stop over at a highly rated vineyard restaurant in the Hemel-& Aarde Valley where the owners will host us for a culinary feast and extraordinary wine paring lunch (all their staff is WSET trained, level 2 and they are planning to do Level 3 in 2017). After lunch we visit a family owned vineyard with a fabulous husband and wife winemaking team who have consistently produced 5 star wines over the last few years. The evening is at leisure in picturesque Hermanus with views over the ocean, with perhaps some luck in whale spotting. Tuesday 1st August: Wine tasting with brunch at a family oned winery in the rustic country village of Napier in the beautiful Overberg region. This is a wheat and sheep farming area and the rolling hills are green with waving fields of wheat as far as the eye can see this time of the year. In the afternoon we reach the Robertson Valley, where we are hosted by a major producer of export wines, famous for their world class Chardonnays. We get to taste some of their older vintages from their underground maturation cellar. The evening will be enjoyed with a wine tasting dinner at a small artisanal producer in the area. Wednesday 2nd August: Nothing compares with a sparkling wine tasting in the morning! We get to do that at a large producer of some of SA’s most famous MCC bubbles. Driving further on Route 62 we get to the Breedekloof Valley, previously known for grape growing and mostly large volume wines. Today however there are plenty of producers focussing on old vines and deliver some very interesting hidden gems. We experience true Breedekloof farm hospitality with regional cuisine for lunch. We travel further up the stunning valley to reach the picturesque town of Tulbagh, where we are hosted for a special wine tasting by the Diner’s Club Winemaker of the Year 2016, joined by some fellow producers of the Pinotage Association. Thursday 3rd August: We have an early morning departure, taking the less travelled roads of the West Coast leading to Piekenierskloof for a tasting in the Olifants River. Following this river to the ocean we’ll be arriving at the small fishing village of Doring Bay, home to an artisenal vineyard on the arid coast, very close to the cold Benguela Current. The winery is literally situated on the rocks, previously a crayfish factory that went out of business but now flourishes as a remote tourist attraction. We are treated to a very unique experience during lunch. Back on the road heading into the remote Cederberg Mountains, we stay over at Cederberg Wines, known as the highest altitude vineyards in South Africa. We are hosted by the owner/winemaker for a wine tasting dinner. Friday 4th August: An early morning vineyard walk brings an understanding and appreciation of the uniqueness of this special place on earth. On our way back towards Cape Town, we stop for very special vineyard visit with a renowned Swartland viticultural vine guru, credited for discovering old bush vines and partering with talented young winemakers to turn them into several five star wines. Our last stop is at the quaint and vibrant artistic village of Riebeek Kasteel and home of the Swartland Independants group of winemakers. 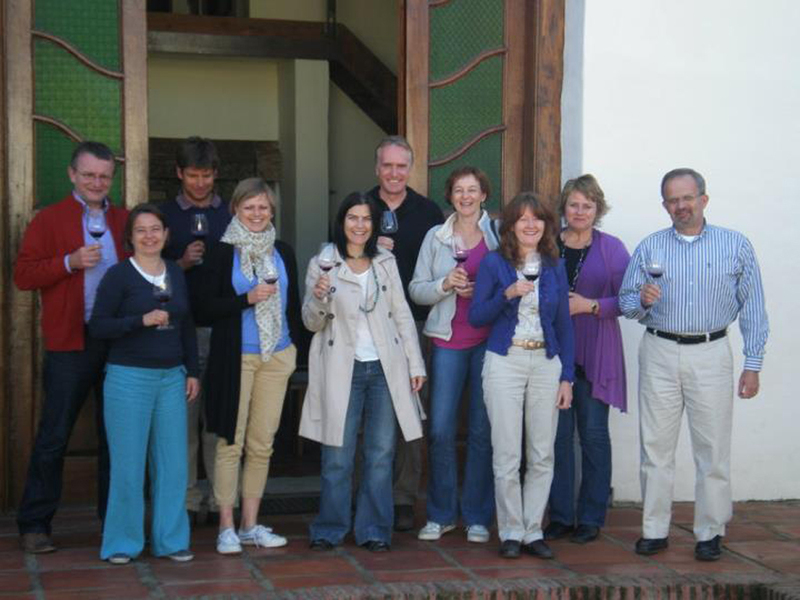 We have a social evening with this group of inspiring and highly motivated “craftsman” who produce world class wines. The next moring after an early breakfast we depart for Cape Town International Airport.